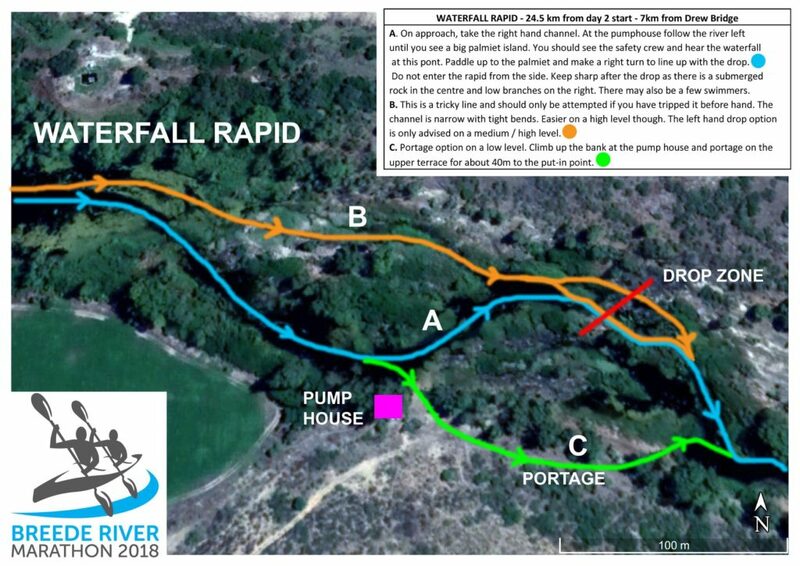 Waterfall rapid will be reached 6.5km after Drew Bridge. If you know the river well, you can follow the palmiet channels on the left as you approach the rapid. If not, follow the flow which sweeps right and then back left again. As you approach the palmiet island just above the rapid, decide whether you want to go left or right of the island. Left is slower but lines you up better for the drop into the rapid. The traditional line is the drop to the right of the rocks. Once through the drop paddle hard left to avoid the submerged tree just below the rapid. If you go down the drop to the left of the rocks it’s advised that you approach from the left of the palmiet island to avoid going into the rapid at an angle.